The story of the Venezuelan economy and its troubled currency, the bolivar, can be summed up with the following phrase: “From bad to worse”—over and over again. Yes, the ever deteriorating situation in Venezuela has taken yet another turn for the worse. In a panicked, misguided response to the country’s economic woes, Venezuelan president Nicolas Maduro has requested emergency powers over the economy. And the Maduro government recently announced plans to institute a new exchange rate for tourists in an attempt to quash arbitrage-driven currency smuggling. These measures will likely prove too little, too late for the Venezuelan economy and its troubled currency, the bolivar. Indeed, the country’s economy has been in decline since Hugo Chavez imposed his unique brand of socialism on Venezuela. For years, Venezuela has sustained a massive social spending program, combined with costly price and labor controls, as well as an aggressive annual foreign aid strategy. This fiscal house of cards has been kept afloat—barely—by oil revenues. But as the price tag of the Chavez/Maduro regime has grown, the country has dipped more and more into the coffers of its state-owned oil company, PDVSA, and (increasingly) the country’s central bank. Since Chavez’s death, this house of cards has begun to collapse, and the black market exchange rate between the bolivar (VEF) and the U.S. dollar (USD) tells the tale. 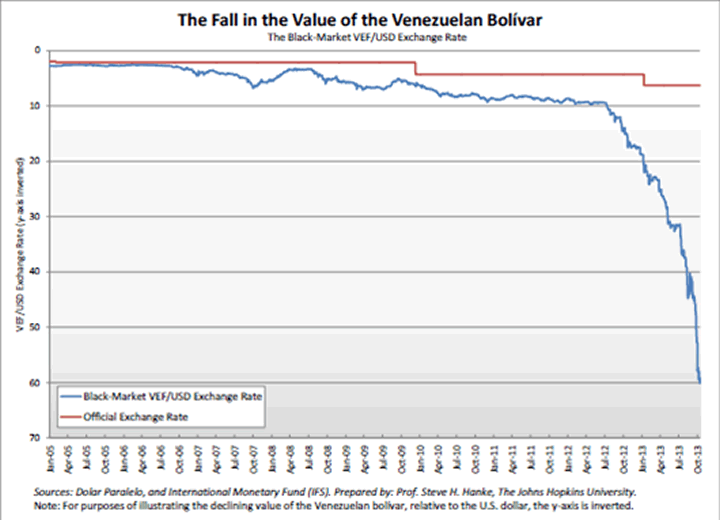 Since Chavez’s death on March 5, 2013, the bolivar has lost 62.36% of its value on the black market, as shown in the chart below the jump. 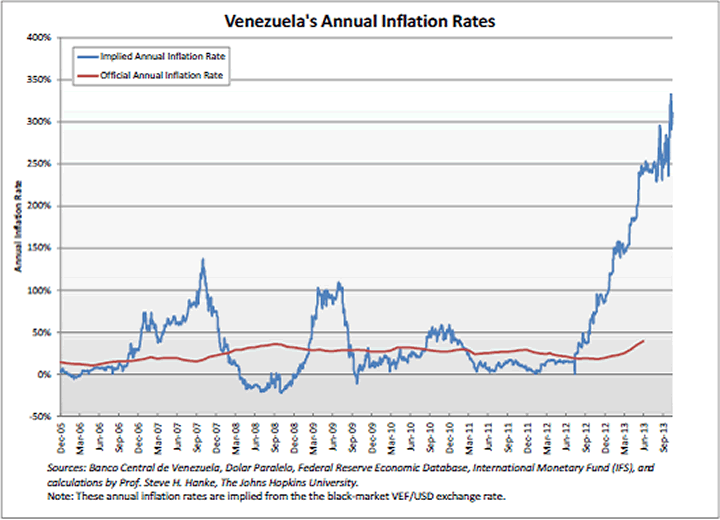 This, in turn has brought about very high inflation in Venezuela. The government has responded by imposing ever tougher price controls to suppress the inflation. But those policies have failed, resulting in shortages of critical goods, such as toilet paper, without addressing the root cause of Venezuela’s inflation woes. The Maduro government has responded to this problem with the very same tactics employed by other regimes with troubled currencies. Yes, from Mugabe’s Zimbabwe to North Korea today, the playbook is simple, if misguided: deny and deceive. Currently, official government data put Venezuela’s inflation rate at a mere 50% (a woefully inaccurate figure to begin with). Yet, on Tuesday October 22nd, finance minister Nelson Merentes submitted a proposed 2014 budget to the National Assembly that projected inflation at a level nearly half of the current official inflation rate. At present, it seems doubtful that the Maduro government has any reason for optimism about Venezuela’s economy in the coming year. Indeed, this latest budget figure is simply an attempt to hide the truth about the Venezuela’s massive inflation problem. 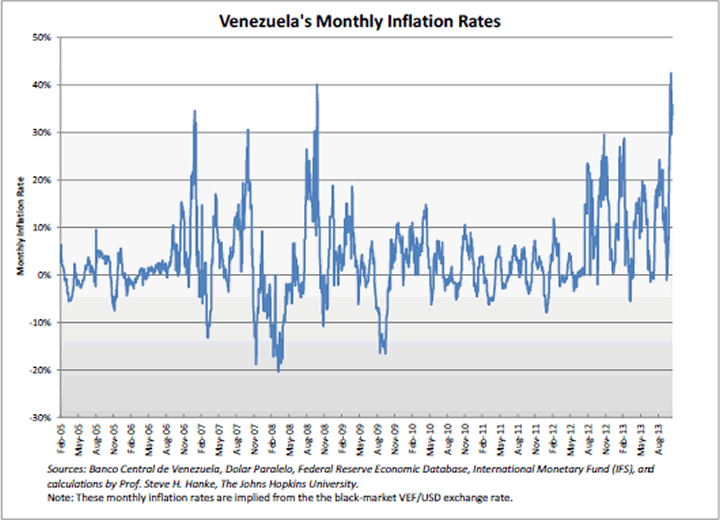 Just how big of a problem is inflation in Venezuela? The implied annual inflation rate in Venezuela is actually now in the triple digits, coming in at a whopping 283%, as shown in the chart below. What’s more, the implied monthly inflation rate has now ramped up to 36%, as shown in the chart below. That’s dangerously close to the hyperinflation threshold of 50% per month. This is due to an accelerating depreciation of the bolivar, reflecting Venezuelan’s deteriorating economic outlook. At this pace, Venezuela could join the Hall of Shame as the world’s 60th episode of hyperinflation. Alas, it seems the Maduro government is determined to double down on its failed policies, rather than face the music about the failed chavismo economic experiment.